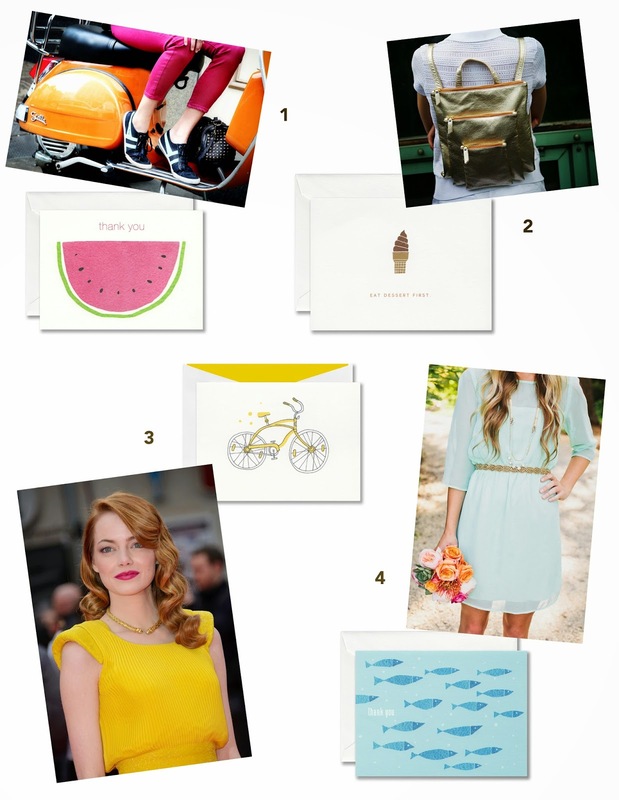 1: Colored denim and Summer Watermelon Thank You Notes: Come on out and play. Sweet and delicious, a slice of the juiciest of watermelons takes center stage on this thank you note. Perfect for a thoughtful message after the summer backyard barbecue. 2. Metallic accessories and Foil Stamped Ice Cream Notes: We all scream for the cold, chocolaty swirls that take center stage on this note, part of our Sweet Stuff collection. Perfectly presented atop a sugar cone and accompanied by a very merry mantra — “Eat Dessert First” — it’s the perfect choice for an invitation to the ice cream social and quick hello to your fellow frozen treat lover alike. 3. Bold, bright yellow and Bicycle Notes: Put the pedal to the metal. On this note — part of our Retro Delights collection — our bicycle is presented in vibrant in yellow and accompanied by a bevvy of bubbles. Perfect for an afternoon picnic invitation and thank you from the free spirit alike. 4. Soft aqua and School of Fish Thank You Notes: Come on out and play. Everything is better with friends suggests this thank you note, which takes us under the sea for a swim with some finned friends. Perfect for a thoughtful message after a weekend on the coast. Life's richer with friends, so let's stay in touch! Sign up for our newsletter here.